Classic Modern Jewelry - This is a handcrafted sterling silver cross pendant created from tubing. The necklace is accented by a round blue turquoise cabochon stone and comes with an 18" Figaro chain. 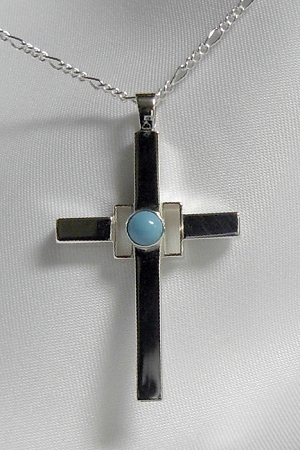 Unique Cross made with sterling silver tubes surrounding a round turquoise cabochon. This original design is suspended from a soft 18" sterling silver figaro chain.